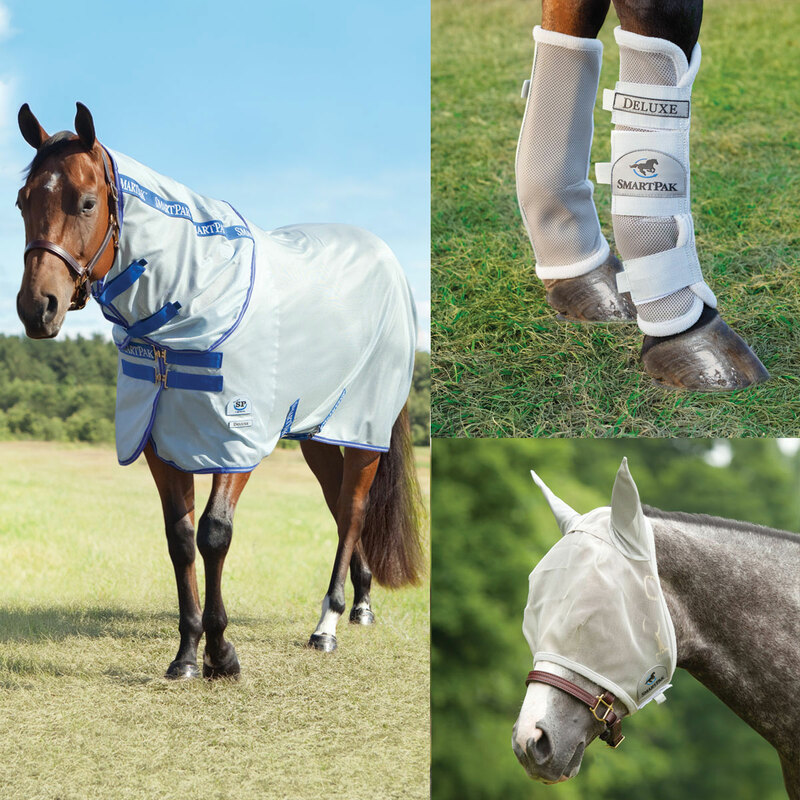 Provide your horse with the ultimate protection from flies this season and save 10%! The Rockin SP Quarter Horse Cut Deluxe Fly Bundle includes the Rockin SP Deluxe Fly Sheet, SmartPak Classic Fly Mask and the set of four SmartPak Deluxe Fly Boots! The Rockin' SP Quarter Horse Cut Fly Sheet with No-Fly Zone is infused with No-Fly Zone, an odorless, EPA-registered insect-repellent that provides a layer of chemical protection to keep the bugs at bay and lasts for at least 70 washings. This sheet also provides UV protection that protects your horse from 95% of damaging UV rays. Designed specifically to accommodate stockier breeds like quarter horses for optimal fit! The Rambo Airtech Ear Net features soft absorbent Airmesh outer and large lycra stretchy ears. The ultimate breathable earnet for the true professional. Classic colors to coordinate with the Rambo range. Rockin' SP® Quarter Horse Cut Deluxe Fly Bundle is rated 3.5 out of 5 by 2. Rated 2 out of 5 by Jeni loves Denny from Not very durable, boots slip, fly mask rubbed I was excited about this bundle package. The sheet is a nice lightweight material, but ripped significantly in the first week. The flymask is not built for a quarter horse jowl. Barely fit, then gave my horse a terrible rub. The boots do not stay up and ate unusable for me. If you could check them, and readjust 3x a day, maybe they would work, but I can't get out that often. Overall, I'm disappointed with this package. Rated 5 out of 5 by Slh1957 from Best Fly Sheet IMO Purchased wrong size (72") for my Haffie; SmartPak customer service great about shipping it back. Since wasn't sure which size bigger my Haflinger would wear I ordered a 76" and 78" and said I would ship one of them back with the 72". No problem they said. The 78" fit my Haffie, the 76" fit my other Haflinger, and the 72" fits my wide but short- back flatshod Walker. So nothing sent back but Customer Service was so sweet about the entire process and made buying/offering to return products with no hassle/etc. a pleasant experience. As far as the product, the reason I kept the fly sheets (all 3) is because SmartPak fly sheets are awesome, they look great, they wear well, and they are roomy enough to fit the wide chested, wide-barreled horses without discomfort. My horses are not uncomfortable in them even in this Georgia heat. Although when it was 110 degree heat index none of them wore the fly sheets or masks. The fly mask is made well, the velcro is wide and secure and the mask stays on. The only thing I don't like is that there is no "hole" to pull the mane through and that has made my horse sweat under the forelock and around the ears. The leg wraps, like the fly mask, are durable, and the velcro secures them well. So far no slip but have only tried them for a couple weeks so time will tell. Smartpak makes "smart" looking products and I like the look they give my horses. Nothing cheap looking like some blankets/fly sheets I have tried in the past.